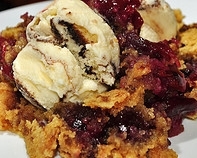 Grab this dump cake recipe when someone tells you at the last minute you need to bring a dessert. Simple to put together and really tasty. There are many homemade cake recipes for you to try at the end of the page. Put layer of pineapple on the bottom of the prepared baking pan. Then layer with cherry pie filling. Sprinkle the cake mix over that and drizzle with butter. Top with chopped nuts and bake for 60 minutes. Serve with whipped cream. Nothing is more easy and more tasty than this little treat.